watches Naruto, likes the top 100s list of music, and hates slice of life, but this anime. Oh man, this anime. I never write reviews. This is my first review ever. I have to say something because there's just way too much emotion in this anime. Sometimes I feel like its going to slow, but then I realize that I have goosebumbs on my skin and I'm sitting upright waiting to see what happens. That's just the kind of anime this is. You have to watch it. It will change your life. Hard to watch, but in a good way. This show tore me apart. I kept wanting to stop watching because it was so heart-wrenching but I just couldn't. Normally, I don't really go in for these kind of shows but there's just something so magical about it. This show is certainly special. An artistic journey as well as an emotional one. This is pretty far from your typical anime. There's no fighting, no super-powers, no giant robots, but somehow this show packs more thrill than any Akame Ga Kill or ALDNOAH.ZERO armed only with a piano and a violin. I'm not going to spoil you in this review by telling you about the plots or the characters. This is just something you need to experience. This show is beautiful. Immediate Thoughts: "Pet Girl of Sakura Hall feels all over again, insta-queued!" I'm not a manga reader, but I heard it received an award and from what I gathered so far, it ain't a joke. First off, DAMN THAT EPISODE FELT LONG TO ME (Good thing)! Everything was presented to you and was developing at such a good pace. Any ways, Your lie in April is a story about a boy that was a prodigy with the piano, but has lost his ability to play due to trauma from his mother passing away. We see his two friends, one of them being likely a love interest, and the typical male playboyish best friend. At the end we meet the last main character Kaori, who specializes in the violin. What will sprout from this unfaithful faithful meeting? A love square, quadrilaterial, polygon thing most likely (This isn't made by P.A works?!?!). Everything was beautiful in this episode mixed in with the light-hearted humor, can't wait til the next episode. Sounds/Audio: 5/5 (It ain't a music anime without fantastic music, piano and violin probably the best combo, I'm ready for eargasms). + Both about a male MC with issues in ability and talent. + Both meet a blonde female that helps them through their troubles and becomes a love interest. + Both have a group of talented friends and individuals around them. + Love issues involved between MC and Friends. - Difference is Pet Sakura is about Art while Shigatsu is about Music. This will be one to remember 5+ years from now! Let's face it. With such a high demand on anime these days, tons of new franchises are being pumped out on a yearly basis so it is only natural that quality shows are going to be showing up less and less. It's safe to say that 'Your Lie in April' is definitely one of those quality shows. In my opinion, it takes at least two episodes for this series to show what it is made of, and it is virtually guaranteed that you won't be disappointed. This is one anime that takes you into the world of classical music seamlessly all while giving us a well-rounded slice-of-life with tasteful romantic tension. The animation quality is extremely vivid when it counts, and it is especially helpful that the art style is refreshing and not too easily compared to any other anime that you have seen before. Much like Clannad, this is bound to be the kind of series that I would recommend to anyone who remotely likes anime. If you haven't attempted this yet, do it for the guardian angel named Kaori! "The moment I met him, my life changed. Everything I saw, everything I heard, everything I felt... All of the scenery around me started to take on color. The whole world began to sparkle..."
Very early on in Your Lie in April (Shigatsu wa Kimi no Uso), viewers are introduced to one universe—one town—with strong disparity. Vivid and busily animated cherry blossoms make way for scenery that is very still and somewhat subdued. Further still, we witness the world of the main character's subconscious, a world that is very overcast and monotone in nature. Most importantly, however, we witness a transition of his world—a tapestry of emotions—through the fullness of color. In short, I believe that what viewers will appreciate most about Your Lie in April is how well it uses the senses to not only complement its thoughtful narrative, but to enhance it. Coupled by a phenomenal soundtrack, down-to-earth characters and deep storytelling, it creates a wholly sensuous experience and a certain early candidate for best anime of 2015. Originally released as a manga before the adaptation by A-1 Pictures, the story follows Arima Kousei, an early-age musical prodigy who lost the drive to play the piano after his instructor, his mother, died of a terminal illness. Two years following her death, Kousei has not since played the piano competitively and has since lost the ability to hear notes as he plays—a result from his mental distress. Kousei's life changes after he meets Miyazono Kaori, a cheerful fellow musician who begins to coerce him to play the piano again. Both lead characters are deep and delightful. Kousei's personality is a byproduct of someone that is emotionally shaken, not stirred. Neither detached nor unstable, he doesn't live his life in denial, but simply as someone who is immobilized by past regrets. His struggles feel realistic rather than exaggerated, which makes him a very likable character. Additionally, Kaori's picturesque and sincere personality is an infectious type that I feel will resonate with viewers well beyond the show's completion. Spontaneous yet earnest and mature, she is very well played from her buoyant attitude to her slightly-encrypted-in-meaning Charlie Brown references. She alongside Kousei and his fiery childhood friend Sawabe Tsubaki grow tremendously as the show progresses, and even the rest of the supporting cast are introduced with engaging back-story that contributes well to the plot. The characters are tangled into a web of fate that is not seemingly outrageous but, rather, very tangible.This is also due to the show's maturely paced narrative: Sprinkled with bits of comedy, its drama leaves the monkey wrenches in the toolbox and instead unfolds in a manner that is more sedated. With this said, I had almost zero issues relating to the events of the anime as they unfold, yet the attentive, musically-honed watcher can catch some absolutely rewarding use of symbolism. This is a huge achievement. Being an anime where music is the cornerstone of its makeup, Your Lie in April does not disappoint with its covers of classical pieces. From Chopin to Debussy, performances are in full form and are top notch. Even the original soundtrack—though short in track length—is both powerful and appropriately themed. 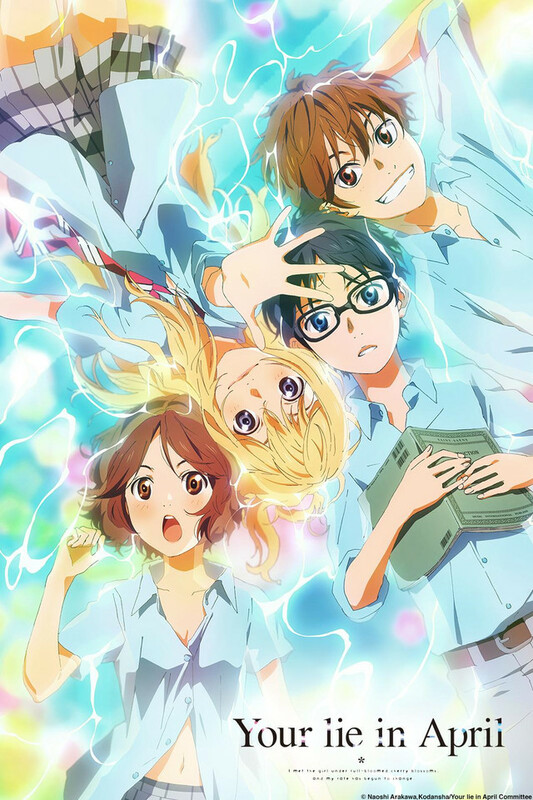 While the opening/ending themes aren't real knockout tracks, there's more than enough musical prowess beaming from Your Lie in April to satisfy the ears. Acting is also very well done, particularly with Taneda Risa (Mirai from Beyond the Boundary, Strike the Blood's Yukina) deviating from her usual composed character roles to play Kaori. As far as visual presentation is considered, Your Lie In April's winsome qualities are largely due in part of its fairly unique shoujo art style and stellar presentation. I especially like the departure from the typical slender look of shoujo characters in favor of facial features that are a bit rounder and fuller; It certainly gives the anime its own definitive look. For animation effects, this is certainly on par with previous work from A-1 Pictures (Anohana, Sword Art Online, Aldnoah Zero). Although performances are knowingly where the hearts of viewers are likely to be moved, care was taken to incorporate solid quality throughout. Still, the level of detail during the big events, like characters' posture and movement and finger placement, is impressive nonetheless. As aforementioned, these qualities mesh masterfully and strengthened my overall experience. As much as it is positive to mention, Your Lie in April is certainly not without its mishaps. The biggest wonder, in my opinion, lies in how little significance Watari Ryouta (another childhood friend of Kousei and Tsubaki) plays in the development of the plot. With little serious dialogue and input, I can't help but to ponder, given the relationship that he has with Kousei, what type of opportunities were missed to further establish Kousei's character. Rather than being an integral part of the story, he is instead outcast as an obstacle and a character that proves to be even less important than others with only a few episodes of screen time. Additionally, while the plot is objectively solid, it isn't exactly groundbreaking or original. The lack of maniacal twists and turns adds a welcome mature and level-headed storytelling, but substantiates some predictability. For many compounding events, foreshadowing is laid thick and the element of surprise is almost all but eliminated. Nevertheless, it never caused any scenes to lose emotional weight. And emotional it is. Your Lie In April is truly a visceral experience, combining the senses with a narrative that elicits raw emotions. From beginning to its beautiful, bittersweet end, I couldn't help but to feel impacted on a personal level. I couldn't help but to feel elated during moral victories and heart-wrenched when things went sour. I couldn't help but to ponder the personalities of each character and how I am similar or different. I couldn't help but to find myself wanting to relate to characters on a magnitude much higher than the anime norm. This is where Your Lie in April begins to find level ground with the best of the slice-of-life genre. Simply put, Your Lie in April is an outstanding anime that deserves your attention. It is one of the best anime I've seen in recent memory and an instant favorite of mine that I'm sure to revisit. Make no mistake: This is one lie worth believing. My favorite anime of the year, and potentially of everything I've seen. This season, I had to drop down to about 8 series to watch from the previous 31 because I had a particularly hard quarter in school. Being a double music major, Your Lie in April stood out to me from the descriptions. What I didn't know is that I was soon to be watching a series that I wouldn't fall in love with just because of Beethoven, Mozart or Chopin, but also because of Kosei, Kaori and Tsubaki. As you can read the detailed plot description yourself, I'll skip to saying that this anime uses music to tell a story of a young musician who was quite literally the best, but then fell from grace into being a complete emotional and musical wreck. Despite efforts from his childhood friends nobody could help him, until he met a violinist who played for herself. This is a story of friendship, love, music but above all else it's a story of overcoming the past, insecurities, and finding your inner musician. The animation, art, and naturally music is incredible. Granted the classical compositions are masterpieces, but the original soundtrack is incredible in its own right. The music combines with the use of color to create an image that neither visuals or music could do alone. From this year this is my favorite anime. If this anime continues strong then it's likely to be my favorite anime ever. I love it that much. I went in expecting something good, but what I got was something incredible. HOOKED FROM THE START!!! XD FOR THOSE WHO LIKE CLASSICAL MUSIC!!! This is worth watching!! Don't miss out on a great anime, just because is about a pianist. The storyline is really good and interesting. It hooks the audience quite quickly with many suspenseful events. The art....is sooo good!!! The sudden change between a colourful scene and a black and white is amazing!!! It changes the atmosphere, and makes the story even more interesting. THE MUSIC IS PERFECT, op and ed theme songs are really and the way classical music is incorporated along the with character's personality makes this a true work of art! Normally I avoid Shoujo shows like the plague. I hate love-triangles, the same cliched one dimension characters that I see in ever shoujo and the eventual girl-vs-girl hate that's going to happen. But so far, this show has made me fall in love with every single character that's come on screen. The soundtrack is to die for and the animation is so close to being flawless it's painful! I can honestly say this is my favorite anime of the season. I count down the days till the next episode's release! This anime has the feels train leaving. You need to get on it! This has me looking at Toradora! all over again. It makes you want to feel like going to buy that favorite item for that special someone. I personally like it because of the pacing, the character interaction, and the smooth animation. It has a very good story so far I hope ends well in march. I really love this anime! I was trying to find something to watch on CR and thought this sounded good and holy crap I'm glad I decided to watch this anime! I'm loving the colors,art, characters. the music is really good and It's making me want to buy a piano and learning how to use it. Love, love, love this anime!